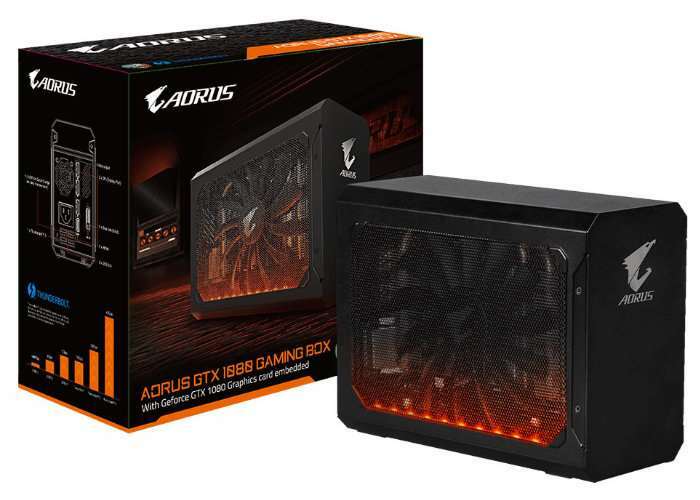 Gigabyte has today launched its previously unveiled external graphics solution which takes the form of the Aorus GTX 1080 Gaming Box, making it available to purchase from today for $750. The Aorus GTX 1080 has been built using the same platform as the company’s GTX 1070 Gaming Box but now provides users with the advantage of its new GeForce GTX 1080 Mini graphics card. The external graphics card Damien box is also equipped with a 80 Plus Gold-certified 450W PSU and connects to your current system using a Thunderbolt 3 port offering 40GB per second connection speeds. Together with a quick charge USB 3.0 port as well as three more standard USB 3.0 ports offering 5GBps. The included graphics GeForce GTX 1080 card memory is clocked at 10 GHz (GDDR5X-effective) and offers 1632 core and 1771 MHz boosted. Other ports include DisplayPort 1.4 and 1 x HDMI 2.0 and 1 x dual-link DVI-D and is finished with LED lighting for extra bling.